Finally, a meal on my blog that actually uses avocado! I made my favorite cobb salad today and it came out delicious! Unlike restaurant cobbs that pile on the fried chicken, cheese, and bacon, my version is much lighter and heart healthy. 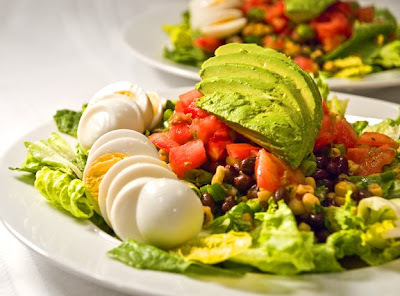 I think it's the natural affinity of lime, egg, and avocado that makes this salad so great. Except for the tomatoes, which shouldn't even be called tomatoes in the winter months because the don't even somewhat resemble the sumptuous beauties I grown in my garden in the summer, it's a fairly winter-friendly salad that makes me yearn for the warm weather to come. Because it's packed with protein, this salad makes a very satisfying meal that will ward off hunger for hours. In small bowl mix together the tomatoes and scallions, season with black pepper and set aside (do not add salt because it will draw out the juice from the tomatoes and leave them mushy). In another small bowl combine beans, corn, jalapeños, parsley, garlic, and chipotle sauce. Season with salt and pepper and set aside. Slice avocado and put in a shallow bowl. Pour lime juice over every exposed inch of the avocado slices to prevent them from browning. Drain lime juice off of avocado slices and distribute the juice evenly between the bean and tomato mixtures. Mix both bowls well. Assemble salads by first laying a handful of lettuce on the plate. Add a large spoonful of the bean mixture, then the tomatoes. Top with 1/4 of the avocado and two eggs. I served a small bowl of shredded cheddar cheese along side for my non-dieting hubby. Oops! "remove seeds and ribs" referred to the jalapenos. I just fixed it. Thanks so much!